Location: Hotel Teres is situated at the entrance of park “Tulbeto”, in a close vicinity to the ethnographic complex. This allows you to take a walk along the nature and to view the complex and visit the legendary Thracian domed tomb. The centre of the town is just 5 minutes walk to the hotel. Accommodation: The hotel offers ten double rooms in an ancient style and one luxurious apartment. All contemporary comforts are provided for the complete relax of guests – air conditioning, telephone, cable TV, internet and mini- bar. 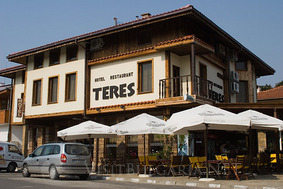 Wine & Dine: Restaurant “Teres” offers 36 seats and offers a pleasant atmosphere for your breakfast, lunch or dinner. A rich menu of delicious meals and a wide range of drinks and refreshments will make you relax and enjoy your stay to the maximum in the Valley of Roses.